Los Angeles, CA -- As per the requirements of the WBC, fighters involved in title fights must pass a routine physical and weight check 4 weeks before fight day. For the Pacquiao-Marquez bout which is slated at 130 pounds, both Pacquiao and Marquez should not weight more than 140 pounds a month before the fight. 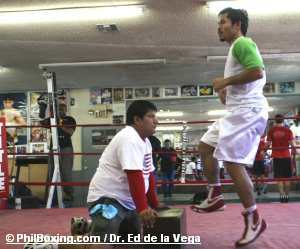 Today, in the company of his brother Bobby Pacquiao, trainer Boboy Fernandez, boxer Ernel Fontanilla and PR man Winchell Campos, the Pacman drove to San Pedro, California an LA suburb some 40 miles south of downtown LA, to keep an appointment with Dr. Gluckman and undergo a routine physical exams and more importantly, a weight check. Needless to say, the Pacman as well as Bobby Pacquiao who is slated to fight two days prior to the Pacquiao-Marquez fight at the Hard Rock Resort Casino in Las Vegas, passed the required physical exams with flying colors. “Walang problema sa timbang and healthwise, Manny is in excellent shape”, (there is no weight problem and he is in good health) Campos informed this writer. Taking a trip to San Pedro for the physical checkup did not bode well with Pacquiao because he wants to keep his training schedule uninterrupted. But being the professional that he is, he knows that there are certain requirements to be kept as part of the whole fight scene. One of the requirements is the physical exams and weight check. Thus Pacquiao took the trip to San Pedro. Tomorrow, training resumes as usual. Being a Thursday, sparring is on schedule. No doubt, the Pacman will again be exchanging leathers with three very good Latino fighters to continue to sharpen his skills and practice the battle plan for March 15t. As usual, the Wildcard Gym will again be empty of non-essential personnel, particularly kibitzers and boxing fans as the Pacman trains. At three o’clock however, fans will be allowed a few minutes to rub elbows with Pacquiao, pose for some souvenir photos and get autographs. Then Pacquiao is off to the Thai restaurant next door for some quick late lunch and then return to his condo for the much needed rest to end his day.